Renovated apartment ( 40 m2 ) on a great location - down town Belgrade Complitly renovated apt located in famous turistic area Skadarlija or Bohemian quarter. Minutes away to restaurants, bars, clubs, shops, museums etc.Really great location close to all arractions you dont need public transportation all walking distance! Airport transfer can be arranged! 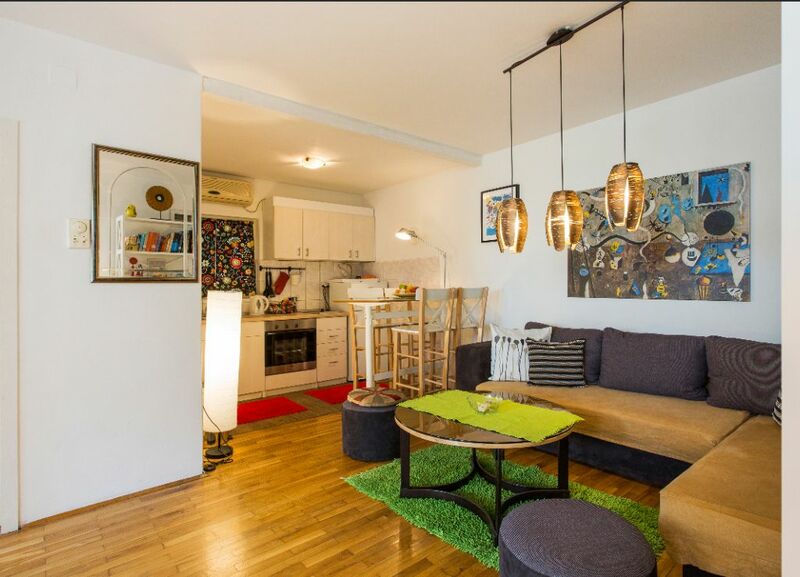 Very nice apartment located in the best part of Belgrade famous Belgrade bohemian quarter area (Skadarlija). This is definitely very good location for somebody staying in Belgrade, this area is full of good restaurants, bars,clubs but also with museums, historical buildings,fortress, parks, etc. It is possible to find a parking nearby!! The apartment is very cozy and charming and has open concept style with living room, office space and - kitchen .The apartment has private bedroom with french style bed (for two) and pull out sofa bed ( for two) in the living room. Kitchen and bathroom are fully equipped. (You will find everything that you need in kitchen, for making your own meal, so you can feel like you are at your home) . Hi speed internet in apartment, air conditioner is free of charge. Strahinića Bana street (street with lot of bars restaurants, clubs 200 meters from apartment) and many other interesting places are nearby. But if you want to go outside of downtown core, transportation is nearby. Wireless internet, clean sheets, is provided. You will be provided with all different sorts of information about Belgrade which will help you to have your staying memorable. We have lock code system late check in is possible!! Kitchen and bathroom are fully equipped. (You will find everything that you need in kitchen, for making your own meal, so you can feel like you are at your home) . Hi speed internet in apartment, air conditioner is free of charge.